Each and every day of our Route 66 itinerary is designed to show you all the big sites and hidden gems along the Mother Road. Pose for a photo in front of their GIANT Route 66 mural before exploring the Route 66 Hall of Fame and Museum as well as their moving War Museum. After that, poke your head into Bob Waldmire (Filmore in the movie Cars)'s Route 66 motorhome before wandering around town to admire the many murals. You'll finish your time in Pontiac with a stroll through the one-and-only Pontiac Oakland Packard Museum. Here you'll find the only museum in the world dedicated to just Pontiacs! Try counting their huge oil can collection before hitting the road for Atlanta, IL for an included lunch! Towering 630 feet above the city of St. Louis, the Gateway Arch is one of the most recognizable landmarks in the world. Included with your visit is a ticket to the very top! From the angled windows you'll get a first-class view of the Mighty Mississippi River, Busch Stadium, and downtown St. Louis. The fun in St. Louis doesn't end at the arch! From there you'll head to one of the most amazing cathedrals in America- Cathedral Basilica. Bask in awe at the largest tile mosaic in North America before heading to Anheiser Busch for a brewery tour (and beer samples). 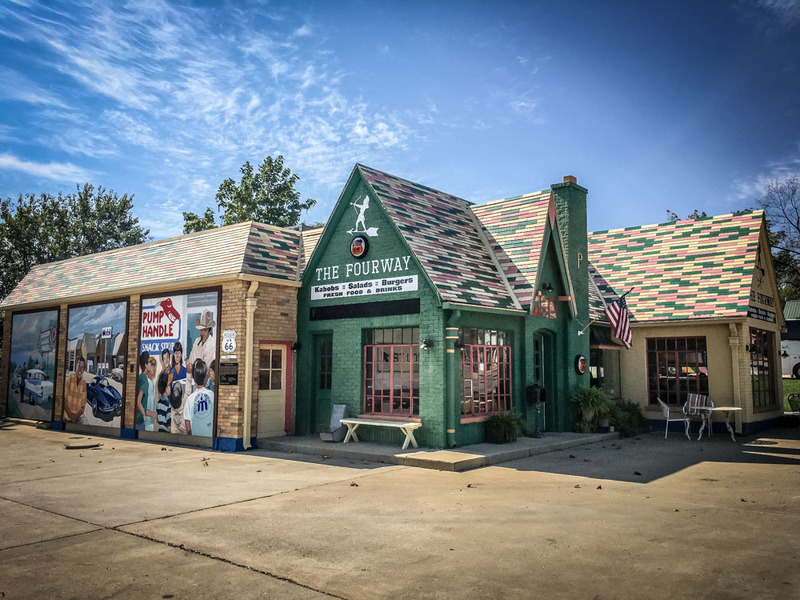 Our Route 66 adventure will take you to plenty of vintage filling stations, but only one that's been turned into a stunning little cafe. The FourWay in Cuba, MO is full of charm both outside and inside. Longtime friends of Two Lane America, The FourWay closes down for the afternoon and hosts just us for one of our included lunches! Gary Turner used to be one of those people you just had to meet on a Route 66 trip. Since his passing, his daughter and son-in-law have proudly picked up his torch. Full of old cars and funky knick-knacks, Gary's Filling Station is one of our favorite stops on Route 66. We've been all over the country, and this has to be one of the most powerful places we've ever visited. Walk the outdoor memorial while a park ranger describes the rich symbolism of each and every item in the memorial. After that, go inside for the museum- a moving multimedia exploration of the bombing, capture & conviction of its perpetrators, and the impact the tragedy had on the world. For another moving experience, walk back down to the memorial at night for some quiet reflection. It may be one little Texas town, but there sure is a lot to see! We'll start at the U-Drop Inn, quite possibly the most beautiful filling station to ever grace the U.S. landscape. Fully restored as a visitors center and gift shop, it's a great place to take a load off and pose for pictures in the same booth Elvis sat in on his Route 66 trips! Afterwards, we'll head up a couple blocks for a view of the tallest water tower in Texas before stopping at the town's Blarney Stone- straight from Ireland! Bring your appetite for this included dinner at the world-famous Big Texan Steak Ranch. Limos will pick us up and bring us home from this massive, fun, and delicious steak house. Think you can handle their 72 oz. steak challenge? We've seen many try, only few succeed! Even if you don't try the challenge, you definitely won't leave hungry. A must-see for any diehard road traveller, Cadillac Ranch is really something else. A bunch of Cadillacs buried nose-down in the dirt... What else can we say? Oh, don't worry... We'll bring the spray paint too! The only national park on Route 66, Petrified Forest National Park is an unexpected treasure. Capture the stunning vistas of the Painted Desert before walking through giant petrified logs. After the park, we'll stop in Holbrook, AZ at a rock shop so you can grab all the petrified wood your heart desires! The Eagles' song, "Take It Easy." Well, here is your chance to be "standin' on a corner in Winslow, Arizona." Complete with flat-bed Ford! You know it as the inspiration for the "Cozy Cone," in the movie Cars! The Wigwam Motel in Holbrook is one of 2 remaining Wigwam Motels on Route 66 and one of only 3 remaining in the country. In addition to the Wigwam, we'll stop at plenty of vintage hotels such as the Blue Swallow, Roadrunner Lodge, Motel Safari, and the Wagon Wheel. What could we say that would begin to do justice to the Grand Canyon? It's not technically on Route 66, but you can't be this close and not stop by. We'll start the day at a Navajo trading post before entering the park and spending the afternoon hopping from viewpoint to viewpoint! Perhaps the town that put Route 66 back on the map! Tour Angel's Barber Shop where the "Angel of the Route" decided to save the Mother Road and bring tourism to Route 66. Walk next door to the Sno-Cap for a quick bite or drink before wandering through the town's dozens of local shops and roadside attractions. Another inspiration for the movie Cars, Hackberry General Store is an absolute feast for the eyes as vintage cars, signs, and other automobilia seem to pop out at every turn. Grab a Route 66 Soda and a seat on a picnic bench while a local musician plays music and travelers from all over the world float in and out. Pose for pictures at the "End of the Trail" sign and relish in your awesome accomplishment! Take in the ocean air and enjoy the beach before heading to our included farewell dinner.